Anak Krakatoa, the Indonesia volcano that triggered a deadly tsunami a week ago, has lost two-thirds of its height, a government agency said. The volcano’s height went from 338 meters (1,108 feet) above sea level to 110 meters (360 feet), Indonesia’s Center of Volcanology and Geological Hazard Mitigation said in a report. Additional eruptions from Monday to Thursday also caused the volcano to lose volume of 150 million to 180 million cubic meters (5.3 billion to 6.4 billion cubic feet), the report said. Its volume is now 40 million to 70 million cubic meters (1.4 billion to 2.5 billion cubic feet). The December 22 tsunami was triggered by a volcanic eruption that caused a 64-hectare (158-acre) chunk of Anak Krakatau to slide into the ocean. Government and rescue agencies cited multiple factors in the wave that struck coasts on the islands of Java and Sumatra. 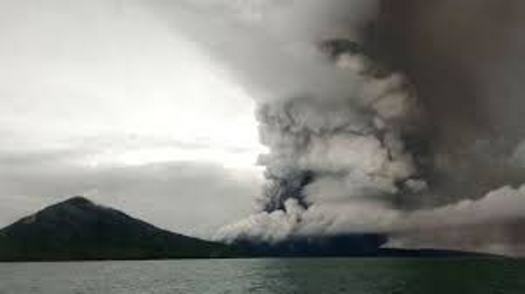 The eruption came at high tide during a full moon, and the Sunda Strait, which runs between Java and Sumatra, also had been experiencing high rainfall. On Saturday, Indonesia revised the number of people killed in last week’s tsunami to 426 people from an earlier toll of 430, citing duplications in government recording. At a press briefing Friday, Sutopo Purwo Nugroho, a spokesman at Indonesia’s disaster management agency, said 7,202 people had been injured, 29 people remained missing and 43,386 had been displaced. Officials said this week that sensors had been placed near Anak Krakatau for better detection of activity within the volcano in hopes of providing a warning about eruptions. Indonesian authorities have been roundly criticized for the state of the country’s tsunami detection and warning system, which has been largely out of action since at least 2012. The alert level for the volcano remains at its second-highest — Level 3. Tremors continue and a pyroclastic flow, a mix of ash, rock and volcanic gases, runs 2 kilometers (1.2 miles) from the crater. Pyroclastic flow can be much more dangerous than lava. More than half the population have been evacuated on Sebesi and Sebuku islands near Anak Krakatau in the Sunda Strait.